Today is the day that I finally get a chance to announce to the world that I’ve signed up for formal yoga training! Don’t let the words here fool you. I’m very excited to have committed to myself. You can talk about something everyday forever, but it’s a totally different story if you act upon it! I’ve signed up. I’ve started the official work. The energy feels right. Speaking of energy, if feels like there is a surplus of it coming my way in support of this change. The Schedule was extremely tight on the day of the orientation, but I made it there with five minutes to spare. Normally, no one would think of that as a big deal, but I’d just spent four hours in the car driving. I kept my thoughts clear the entire time and, luck come my way for there weren’t any roadblocks put in my way (literally!). The program is a 200 hour certification process and it’s put together by the owner(s) of 8 Limbs Yoga in Seattle. It looks to be ‘life’ friendly – that is, you can actually work it into your schedule. My concern (before meeting Anne Phyfe), was, would I fit in? I think of myself as a pretty grounded guy. And, of course, I’m not 25. Turns out that Anne Phyfe said all the right things to give me confidence that it will be better than … work. And, to take that a bit further, the energy came across as very much supportive with regards to my own quest in life. This is really good news. I have the feeling that the schooling will help me enhance what I’m already doing and provide the opportunity for me to get to know the formal language associated with yoga. The program officially starts next month, yet I’m already part way through some of the required reading material. I’m looking forward to critiquing and sharing, for The Path With Heart matches really well with lots of the other material that I’ve blogged about. ‘til next time, do onto others as you would like done onto you! This last week has been a whirl-wind of activity. What I thought was going to be a vacation, turned out to be a full week of work – but it wasn’t the type of work I was expecting. I’d planned on giving myself an easy week where I could enjoy the summer heat, experience some new raw food and maybe, sip some great summer wine. But that was not fully in the cards. I missed out on the wine, but didn’t miss out on the raw foods! Thinking back, I’m kind of glad I decided to go raw for a week during this hectic time. If I hadn’t, I would have eaten out every night and picked up the easiest, fastest food I could have gotten. As it turns out, the raw food that I got to enjoy really didn’t take all that long to prepare – both making and figuring out what to make. What topped the list was a Raw Marinara over zucchini that I’ve told a bunch of people about and they all want the recipe. Well, here it is. I highly recommend it. It’s fast and stores well. I’m sure it could be great over something other than zucchini, but the garden’s productive this year and I’ve got lots of zucchini. So much that I’m giving it away like always. It makes me feel good to be able to share. This was a full meal! The bowl in this picture is probably 2 quarts in size. It’s big enough for an epic salad. Both zucchini that you see in the picture below are in this bowl. If you make this much, you’ll probably find that you won’t be going back for seconds because you won’t be able to finish firsts! Not because it’s not full of flavor, but simply because you’re full. This stuff really hits-the-spot. Before spelling it out, I’ve got to give credit to the source. 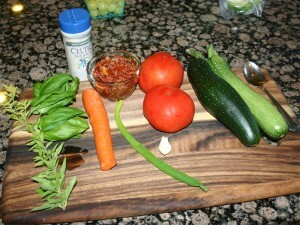 I found this on Jenny Cornbleet’s Raw Food Made Easy site. I’m sure there’s a lot more there, but I just haven’t had the time to poke around and find out. If you find another keeper, please let me know. Start off by pealing and grating the zucchini. You don’t want any of the green (or as little of it as possible) in your meal. But the longer the slices, the more like spaghetti it will be. Grate and set aside on a few clean towels. Zucchini is really watery, so you’re going to let it drain just a little. Now, back to the sauce, I used a blender. You could either use the same, or a food processor. I’m sure both would work just as well for this. If you use a food processor, cut up the carrot and garlic a bit more than what you’d do for a blender. You might even want to turn them first because they are so much harder than everything else. Once you’ve broken the carrot down just a little, add everything else – except the basil. In the blender, grind just enough to just get the mixture to turn. That might be ten seconds or so. Then, add the basil and incorporate. You should still see little green specs because you’ll only grid for another couple seconds. It’s really that easy. If you blend too long, it will liquefy. If you leave it a little chunky, it will feel more like marinara. 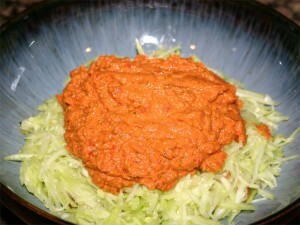 Now, lay out your bed of zucchini in your favorite bowl (not a plate) and cover with a full serving of marinara. What I show in this picture should really feed two people (well, ok, add another zucchini). If you’re just making this for one, just save the extra for another meal. The marinara is just as good the second day! Take note, the picture I show doesn’t show the cayenne pepper. The time I made it and took a picture, I was making it from memory and I left that little bit out. It was good, but the cayenne makes it great! Just a tip of a spoonful is all you need. Maybe as much volume as you’d use salt. A little goes a long way! I got a few extra minutes today to poke around the web and see what I could stumble upon. I found a couple great blogs that I’ve include in my links collections (to the right), but I also came across a great video by Dr. Greger of http://nutritionfacts.org/. The video is called Uprooting the Leading Causes of Death. I usually don’t put time into such long videos (55.50 minutes), but, as it turns out, I did. The first few minutes wet by so fast and the good doctor kept my interest, that pretty soon, I was ½ hour into it! I highly recommend this video and I’m posting it here so you can give it a try if you’ve got an extra hour. The best part about this video is that you can’t tell he’s trying to sell anything. It really does look and sound – and feel – like he’s following his on conscious and providing what should be free, for free! I am so looking forward to the future versions of this lecture that will include Raw Vegan as the ‘cleanest’ category. But, to get there, we’ll need a few more people to fit the bill. You want to give it a try? The side-effects seem like something we would all want to live with!